A Virginia man in the midst of a yearlong hike to North Dakota and back was treated to some Champaign County hospitality as he passed through the area Tuesday and Wednesday. 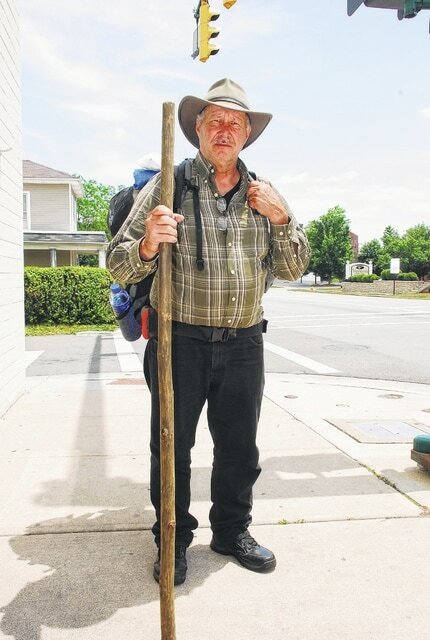 Steve Young, 59, of Patrick Springs, Virginia, has spent the past eight years walking across America in support of Victory Junction, a camp in North Carolina that provides life-changing experiences to children with serious illnesses or chronic medical conditions. The camp was founded in memory of Adam Petty, son of retired NASCAR driver Kyle Petty and grandson of NASCAR legend Richard Petty, who died in a racing accident in 2000. Young said in 2004 he began thinking about a way to help bring attention to the camp for several reasons. Since embarking on his first walk in October 2007, Young has visited 42 states and traveled nearly 27,000 miles, most of which has been by foot. “I don’t solicit rides, but I don’t turn them down if someone offers me a ride,” he said. Along his travels, Young said, he talks about Victory Junction, but doesn’t accept donations for the camp. Instead, he directs them to the camp’s website at www.victoryjunction.org. “I also spread the gospel as I go,” he said. “The Lord is my support team as I travel, and the lord is the one who convinced me to walk out my front door and start walking for this cause. “If I can make a difference in the life of one kid, it’s been worth it,” Young added. Young said he arrived in Mechanicsburg on Tuesday and was greeted by Mayor Greg Kimball and Village Administrator April Huggins-Davis. “They were nice enough to help me find a place to camp for the night,” he said. After spending the evening in his tent behind the Mechanicsburg Municipal Building, Young said he received a ride to the Urbana Municipal Building on Wednesday morning, where he introduced himself to city officials. After spending Wednesday night at Caring Kitchen, Young planned to head west on U.S. Route 36 toward Greenville today. Once in Greenville, he will head north on U.S. Route 127 to Van Wert, where he will then head west on U.S. Route 224 on his way to Indiana. Young said his trip through Champaign County is part of his sixth trip overall since 2007, and by the time he reaches North Dakota and returns home to Virginia, he will have visited 21 states and traveled 7,000 miles. As of now, Young doesn’t think he will hit the road again once this trip is over. Young, who has been working odd jobs since leaving his family’s flooring and window business in 2007, said once he returns to Virginia next year, he’s been offered a job with an asphalt company. Young said he hopes to one day be able to open a camp in Virginia similar to Victory Junction. He carries with him a rough sketch of the camp, which he plans to call Camp Hope.